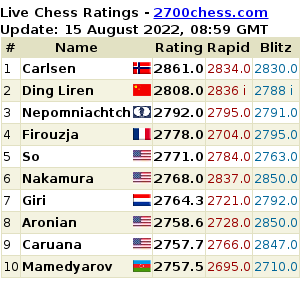 After preparation and practice in several prior Grand Prix events, all players are now challenged to prove their skills. 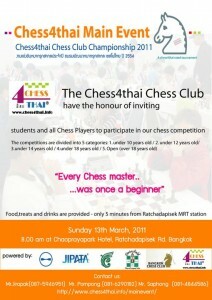 Chess players of all levels, ages and affiliations are invited to participate in this Chess4thai’s Main Annual Event to ensure high standard, number of participants and quality of games. Application: Application opens 06.02.2011 / in the Gainsfield School Tournament. Apply with EEE, Jirapak, Srapong (081-4844586), Panisa; and via e-mail. Online or advance registration is to be considered completed only after all relevant documents have been received. Due to the high rental rates of hotel facility, slightly high entry fees are unavoidable. We ask for your understanding on this matter. In case of a late-start in the Adult category, competition time in Round 6 may be reduced to 25/10 Bronstein. Due to the need to conclude the event on time, we request your cooperation to be punctual. Adherence to planned schedule will be enforced strictly.